Considered one of Rome’s most accomplished displays of baroque architecture, this fine square gained its facades in the mid-17th century under Pope Innocent X, who employed artists like Bernini, Borromini and Rainaldi to transform this square into a showcase of Rome’s great artistry. Rainaldi built the Palazzo Pamphilj, the new home of the pope, but it is now home to the Brazilian Embassy. The building that dominates the square is the Church of Sant'Agnese in Agone, dedicated to the young martyr who is believed to have died on this spot. Famed for its domed ceiling (covered with the sumptuous murals of Ciro Ferri and Sebastiano Corbellini) and its shrine of St. Agnes (with her skull encased in a bejeweled box), there are expert, if expensive, guided tours of the church available on a regular basis. Walk into the center of Piazza Navona and you’ll be rewarded with the spectacular Fontana dei Quattro Fiumi (Fountain of the Four Rivers), a design of Bernini’s that depicts four river gods at the base, from which sprouts the sizable Obelisk of Domitian, not dissimilar to the Egyptian monument in Piazza San Pietro. You may recognize this fountain from the hit movie Angels & Demons, based on the Dan Brown novel. At opposite ends of the Piazza are two more water features, Giacomo Della Porta’s Fontana del Moro, with its distinct rose-colored marble base, and the Fontana del Nettuno, portraying the god of the sea wrestling with an octopus. There’s perhaps no other square in the world that uses water so artistically. Piazza Navona offers the perfect place for a quiet stop during any visit to Rome. Not only are there many cafés and restaurants, so you can reward your walk with espresso and a tartufo (an Italian ice-cream dessert) from the superb Tre Scalini, but the scores of street artists, musicians and performers ensures there isn’t a dull moment. Grand and ancient, yet brimming with life, that’s Piazza Navona. Piazza Navona is in central Rome, less than 15 minutes’ walk from the Trevi Fountain, making these two sights an ideal duet. You can take a Metro/bus combination to get there. 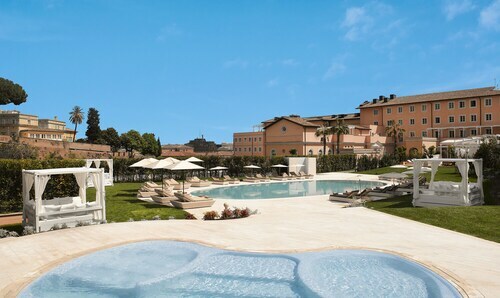 Take a look at our Rome things to do page to discover many more activities while you're here. 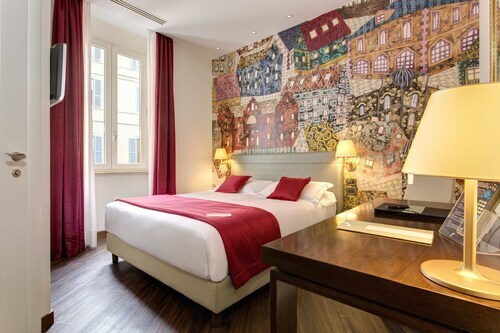 Located in Navona, this hotel is steps from Corso Vittorio Emanuele II and Largo di Torre Argentina. Piazza Navona and Campo de' Fiori are also within 10 minutes. Colosseo Station is 21 minutes by foot and Barberini Station is 22 minutes. 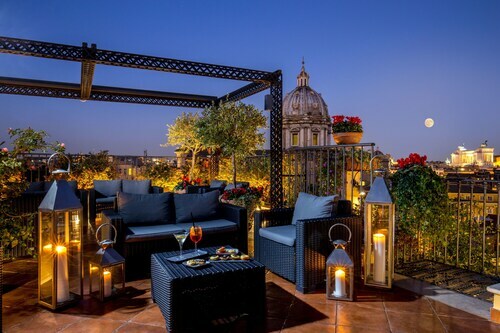 Just off the bustling Piazza Navona, this ivy-clad Rome hotel is 500 meters from the Pantheon, and less than 2 kilometers from the Spanish Steps and Trevi Fountain. 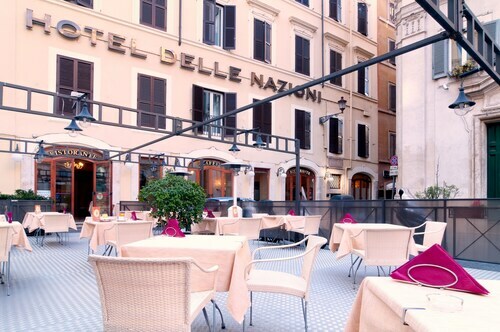 Hotel Delle Nazioni is situated in the heart of Rome, just around the corner from the Trevi Fountain. 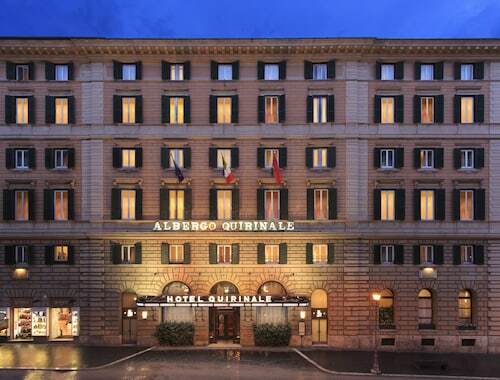 This 4-star hotel is 5 minutes from both the Spanish Steps and stylish Via Condotti shopping. 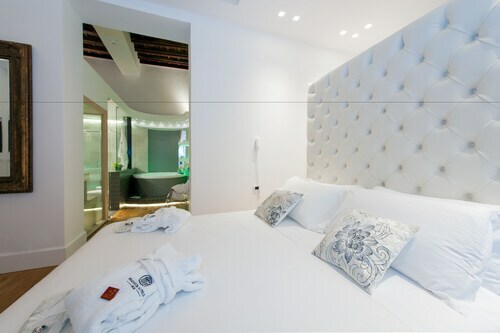 Located in Navona, this boutique hotel is steps from Corso Vittorio Emanuele II and Campo de' Fiori. Piazza Navona and Pantheon are also within 10 minutes. Barberini Station is 25 minutes by foot and Colosseo Station is 25 minutes. 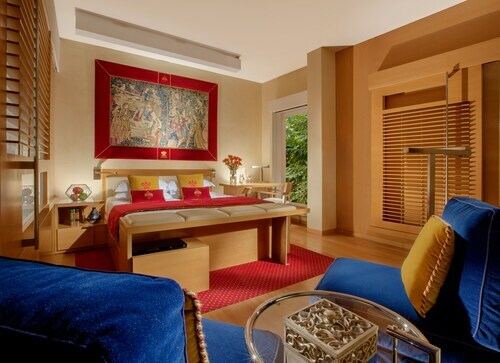 This family-friendly Rome hotel is located on the riverwalk, within a 15-minute walk of Passeggiata del Gianicolo, Castel Sant'Angelo, and Villa Farnesina. St. Peter's Square and Piazza Navona are also within 1 mi (2 km). Ottaviano - San Pietro - Musei Vaticani Station is 21 minutes by foot and Rome San Pietro Station is 23 minutes.